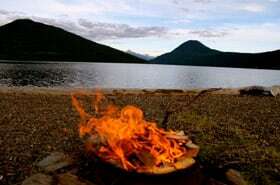 The spacious RV campsite at Bowron Lake Lodge is ideal for guests who are looking to camp in comfort. Our RV campsite offers close proximity to both Bowron Lake and Bowron River, as well as a range of walking trails both on and off the property. Similar to the rest of our property, pets are allowed on a leash in the RV campsite. While we do ask that guests reserve their campsites ahead of time, we have never had to turn campers away and guests of all ages are more than welcome.